The aquaculture workshop has been reschedule for Friday, July 25th at Heartland Business Park in Keysville, VA from 12noon until 5:00pm. Please let an agent know you plan to attend. Thanks! The aquaculture workshop scheduled for tomorrow, Friday, June 13 at Heartland Business Park in Keysville, VA has been postponed until July. More information to follow. We apologize for any inconvenience. Please share this information with anyone you know who may have been attending. Thank you. This April 16th workshop will feature growing fish in cages from 9:30am – 3:30pm at Tide Right in Saluda, VA. $10. 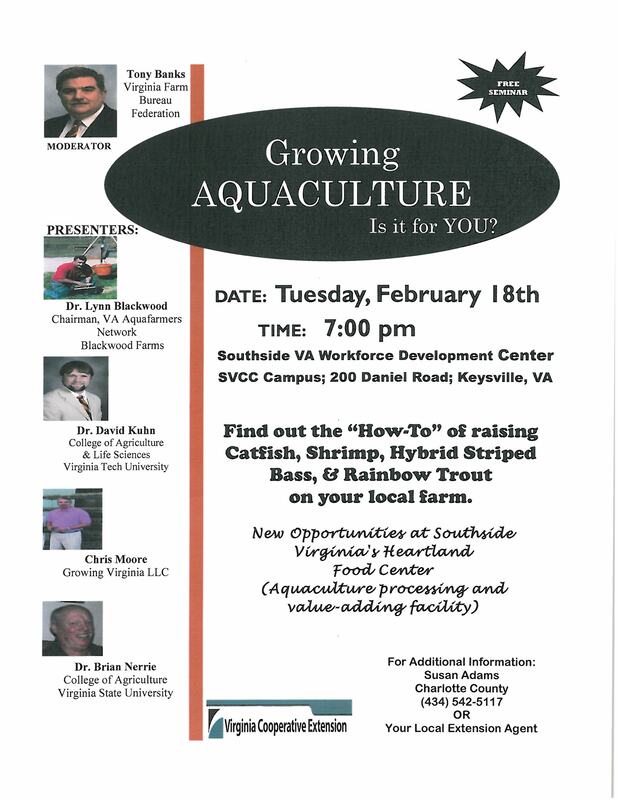 **Note: This meeting is separate from the local meetings to follow the initial community aquaculture meeting that was held on February 18 in Keysville. The agenda for those meetings is still being finalized and will be advertised when prepared. Growing Aquaculture: Is it for you?